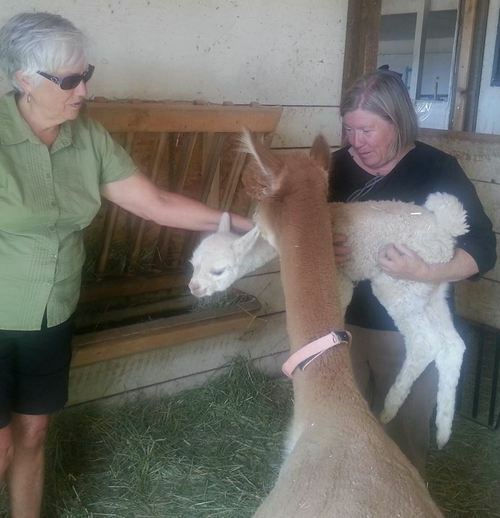 We’ve talked a lot about alpacas in these blog posts, and we hope you have found them to be interesting and entertaining. We wanted to share a few more facts that we thought you’d find fun and worth reading! Even though I know a lot about alpacas, I still find there is more and more to learn everyday with these amazing creatures. Young or old, alpacas have a lot of love and fun to offer us and I think there is no better way to love them back than to learn more about what makes them so special. The first interesting fact I’d like to share with you is that alpaca wool is actually water resistant! Alpaca fiber is similar to cotton which is why their fleece is light and airy when you wear it. Alpaca fibers are the perfect choice when you are looking to stay warm and dry! Next up is that alpaca fibers come in a wide variety of different hues. Believe it or not, there are actually sixteen different tones that you can choose from! You can be sure there will be a color for everyone in the family! Last but not least, alpacas come in two types: Suri and Huacaya. While the Suri has long twisted locks sort of like dreadlocks, the Huacaya has fleece that is crimped similar to a teddy bear. If you’ve ever wondered why some alpacas look so different, now you have your answer! Alpacas are unique animals with so many interesting facts! We hope to share all of these facts with you along the way! Do you know any interesting alpaca facts?